The Beauty Event begins on Thursday, September 10, and this season's gifts may be the best yet. Available in three colors and created exclusively for NM, the carry-it-with-you-anywhere tote comes with samples from Lancome Paris, Le Metier de Beaute, Oribe, Tata Harper, and more. 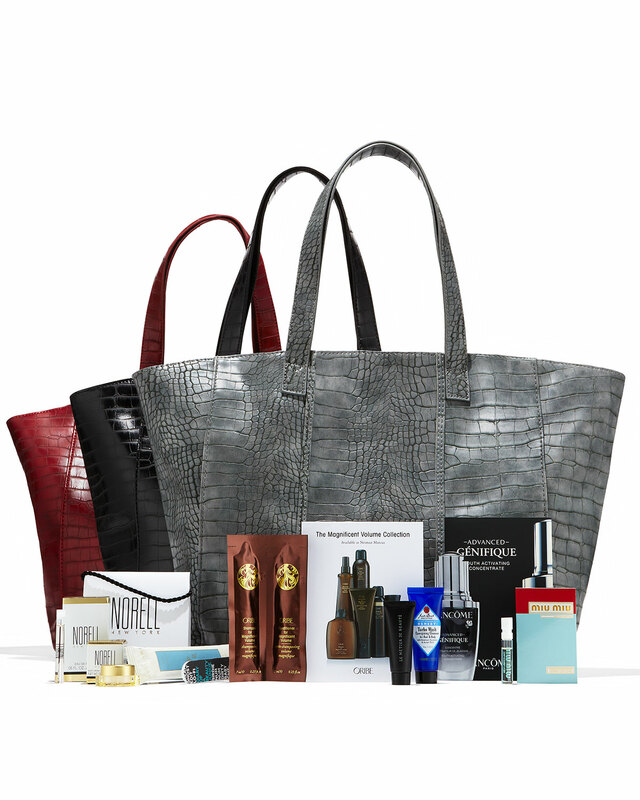 The tote and samples are yours with a $125 purchase of cosmetics or fragrance. Spend $500 or more and receive a cosmetics bag with deluxe samples! Exclusive Neiman Marcus Tote: Available in three colors that go with anything and everything and comes with must-have beauty samples for Fall. Lancôme Paris Advanced Génifique Youth Activating Concentrate • Jack Black Turbo Wash Energizing Cleanser for Hair & Body • Le Métier de Beauté Peau Vierge Anti-Aging Complexe SPF 18 • Norell New York Eau de Parfum and Body Cream • Miu Miu Eau de Parfum • Smith & Cult Nail File • Oribe Shampoo for Magnificent Volume and Conditioner for Magnificent Volume • Tata Harper Elixir Vitae The Ultimate Wrinkle Solution • Bulgari Eau Parfumée au thé bleu Oshibori Refreshing Scented Towel. The value of your Beauty order must total $125 before shipping & tax. One gift per order, while supplies last. Does not apply to previous purchases, or in store locations. Cannot be combined with any other discount offer. With your $500 or more cosmetics or fragrance purchase, receive the carry-it-everywhere tote and beauty samples—plus the cosmetics bag with deluxe beauty samples. Oribe Supershine Moisturizing Cream • Kevyn Aucoin The Flesh Tone Lip Pencil • Acqua di Parma Colonia Cologne • Estée Lauder New Dimensions Shape + Fill Expert Serum • R+Co Park Ave Blow Out Balm • Supersmile Ultimate Lip Treatment. One gift per order, while supplies last. Does not apply to previous purchases, or in store locations. Cannot be combined with any other discount offer. And don't forget to check out the additional samples available from many of our brands in Cosmetics. Contact Neiman Marcus to reserve your tote and samples. The Beauty Event September 10 - Sunday, September 20. Your gifts are waiting! Haha!!! I wonder how long that will last!! It's hard when they email you reminders that you still have things sitting in your cart too! Well..... I'm still holding at Neimans. However!! Big However: I went to Nordstrom to return something and ended up doing the pre-sell for their Lancome bag. No Beauty Trend until October so they don't overlap which is a bummer! Bummer on the one hand, but at least you got your hands on the Lancome bag! It's a different bag and more products; plus, the 'buy-in' was less. Though I did miss out on this tote. However, as nice as it looks, I kept reminding myself that I do have more than a dozen totes! That's the thing, how many of those totes does one woman need?! I have so many of those that I never use!